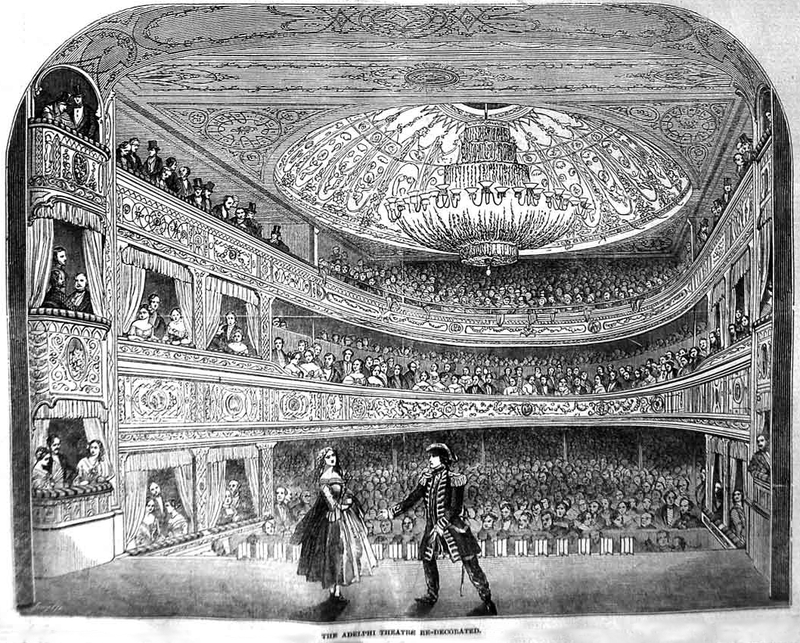 Matthew D. Wyatt's new auditorium at the Adelphi, 1848. The general supervision of the work was credited to the Adelphi business manager, Charles Manby. Thomas Henry Wyatt’s younger brother, Matthew Digby Wyatt was responsible for the decorative design. The auditorium contained two circles with straightened horseshoe parapets. French Rococo themes were a major motif. There was a saucer-shaped dome from which hung a great chandelier. Crimson predominated in the warm coloring of the auditorium. Our earliest recollection of this popular place of Amusement is as the Sans Pareil, in the rear of the colour-shop of its proprietor in the Strand, and whose clever daughter was the star of the theatrical company. With materials so close at hand, the little theatre should have had some advantage of decoration; though, if we remember rightly, it was a sadly bedizened affair, lit by gloomy oil-lamps and redolent of less agreeable odours than oil and orange-peel, the conventional fragrance of theatrical parterres. But the pursy old proprietor has long passed away; gas has superseded oil illumination; and with a better class of performance has come an improved style of decoration. The last re-embellishment of the Adelphi was certainly an improvement upon its predecessor; the ornaments were less provincial than heretofore; the flat celling was raised into a dome, "fretted with golden fires," and a curtain was added very like the covers of Mr. Newbery's children's books. Thus far the decoration was good; but the old ups-and-downs, the cabined lobbies, the primitive staircases, and similar discomforts, were still there. The organic change remained to be made, by which additional convenience might be gained, with a higher style of decoration; and this, we are happy to say, has just been accomplished in the redecoration and partial reconstruction of the approaches. The staircases are now of slate; the seats in the dress circle are provided with backs; and several minor comforts have been added. In the auditory, a very graceful and elegant style of ornament has been adopted prominently in the fronts of the boxes and the ceiling; and there is much gaiety in the wreathing of the supports with flowers. The proscenium boxes are hung with muslin draperies, and surmounted with burnished medallions, which reflect with great brilliancy the light from the central chandelier. The dome in the roof is retained, but now resembles trellis-work, which is agreeably effective. Least there should, however, be an unseasonable lightness in all this, the linings and furniture of the boxes are deep crimson. A drop scene has also been painted. The general alterations have been designed and superintended by Mr. Charles Manby; and the decorations have been designed by Mr. Digby Wyatt, architect, and executed by Mr. Sang. They are very sparkling and tasteful throughout. We have engraved the newly-decorated auditory, in which the public already find themselves at home in as large numbers as of old. The enlargements and re-constructions behind the curtain are also extensive and must largely contribute to the gratification of those before it.